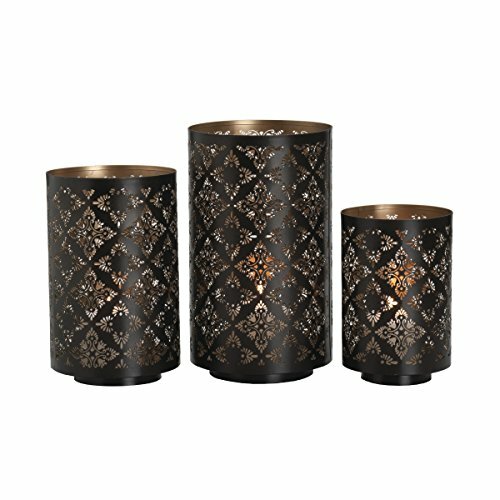 This stylish set of 3 metal luminaries, by Studio Nova features a lovely diamond and floral design that will compliment any room's decor. Its elegant design brings a touch of warm light and style to your home. Candles not included. Set of 3 includes 8 inch, 10 inch and 12 inch high candle holders. Luminaries measure 5.25 x 8 inches, 6.25 x 10 inches, 7 x 12 inches. If you have any questions about this product by Studio Nova, contact us by completing and submitting the form below. If you are looking for a specif part number, please include it with your message.